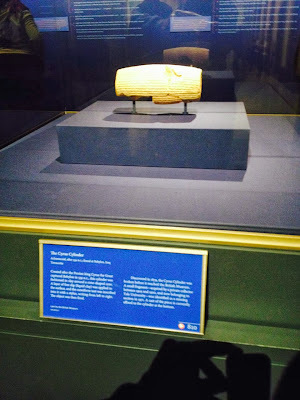 This past week I was back in Los Angeles for a conference - and took an hour on the way there to see the "Cyrus Cylinder" at the Getty Villa. 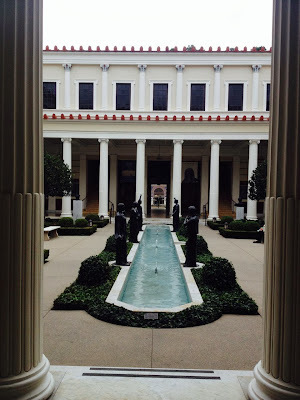 The Getty Villa is located in the Pacific Paliades district of Los Angeles. Admission is free - but you do need to make a reservation ahead of time. On the weekday I went, I was able to make a reservation the day of.Apparently, weekends are much more crowded. Make the reservation on-line, print your ticket, and you're good to go. 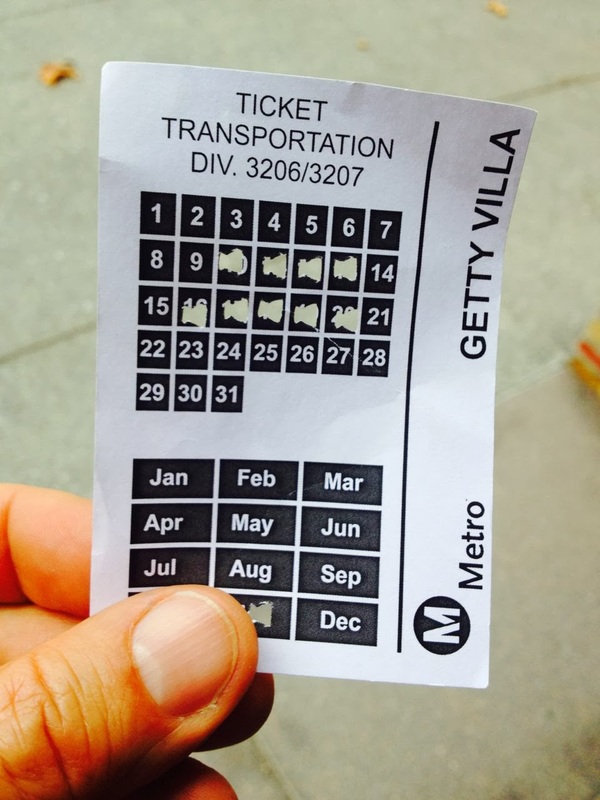 Parking at the Villa is $15 - which is about right for Los Angeles. In an agreement with local residents, you absolutely can NOT park in the adjacent neighborhood and expect to get in. However, there is one way to save some $$. I parked about a mile away at the corner of Los Liones and Sunset Blvd. I walked down Sunset Blvd a few blocks to the Pacific Coast Highway, caught the 534 going north. Got my Getty ticket from the bus driver. This is super important - you need this if you're walking in (as well as the on-line reservation ticket). Two stops up I got off at the Getty Villa. If you're solo like I was, nice way to save some cash. By the way, the building to left in the photo above is NOT the Getty. It's a private residence called "Villa de Leon." Here's a previous post with some addtional information. 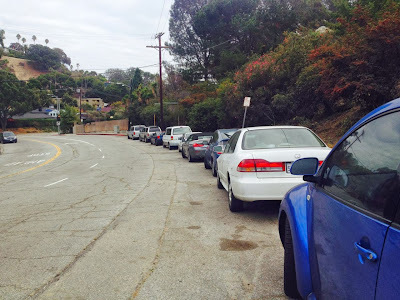 Keep in mind that parking on Los Liones Drive walking along Sunset to the PCH and taking the bus took time - and involved walking along a small section of Sunset Blvd that literally has no sidewalk. In other words, I would not recommend trying this on a "first date", or with kids, etc. Regardless is you go the cheap-o route as I did, or just pay the $15 to park on site, the Getty Villa is as stellar as ever. Thanks to the Getty Trust, the combined Getty Villa and Getty Center (located a few miles to the east just off the 405 Freeway in Brentwood) is the wealthiest private museum in the world. 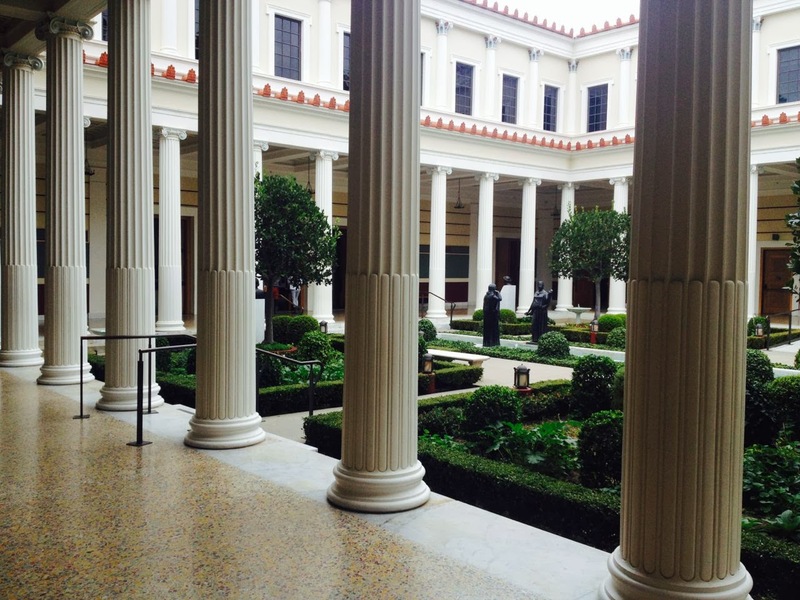 If you've never been the Getty Villa, it's definitely worth a trip. Here's a link to a previous post on a visit I made a few years back with my wife and kids. The reaon I went was to see the Cyrus Cylinder - which is on display until December 8th. As a Christian, I was excited to see something with a direct connection to biblical history. 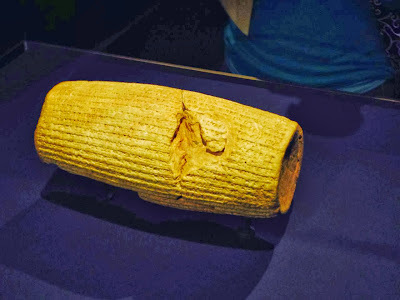 The Cyrus Cylinder is a 2500 year old clay cylinder with a declaration from the ancient Persian King Cyrus the Great. Discovered in Iraq in 1879, it is one of most celebrated discoveries of the ancient world. The cylinder describes Cyrus' policy of allowing his subjects to worship according to their local customs. As a result, it is been called the oldest known charter of universal human rights. To Jews and Christians, the cylinder is seen as corroborative evidence of Cyrus' policy of allowing the Jewish people to return and rebuild the Temple, as described in the biblical texts in the Book of Ezra. 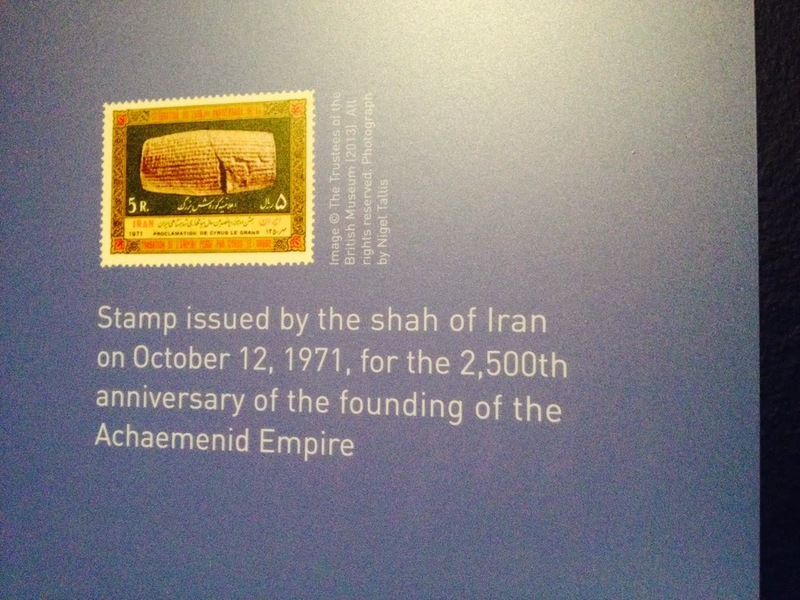 To the massive Persian-American community in Los Angeles, the cylinder is seen as national symbol of Iran - and was put on public display by the Shah in 1971. ∙ a massive Persian community due to political upheaval on the other side of the globe. ∙ the world's riches private museum due to an oil tycoon's preference for the city's climate. ∙ and, described in many numerous posts on this site, a 24/7 global influence due to a little something called the entertainment industry. 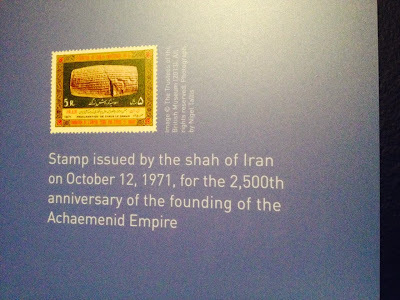 Here's a link to the Cyrus Cylinder at the Getty. If you miss is, the Getty Villa is still woth a trip. And another way of experiencing L.A. 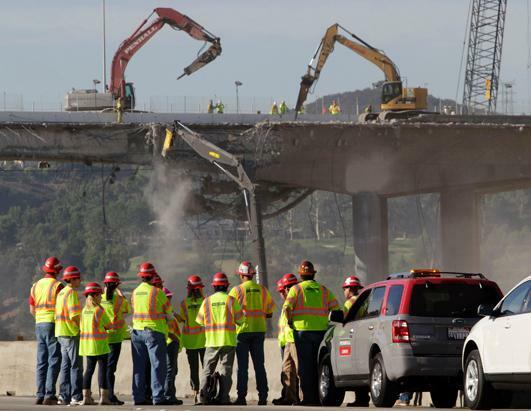 Most of what we feature on Experiencing Los Angeles falls into the category of "Points of Interest" but today I'd like to cover something a little more disinteresting; I-405. Like other freeways in the Southern California area, locals add a definite article when discussing I-405, so it is known as THE four oh five. According to David in LA, our resident LA historian, this is due to the fact that the freeways here used to have names rather than numbers (i.e., The Pasadena Freeway, The Santa Monica Freeway, The San Diego Freeway). And while this interstate is only 72.4 miles long and doesn't actually go to any other states it is the busiest and most congested freeway in America with an estimated 379,000 vehicles per day. We're featuring the 405 because due to its location and congestion, as a visitor you will probably spend a significant amount of time on the 405 whether you like it or not. People spend a LOT of time, their whole lives, people are living, dying, and even recently, people are giving birth on the 405. So let's take a look at some of the most interesting aspects of a freeway that is so LA that it not only has its own twitter account but several parody accounts as well. First of all, I have to mention traffic again. As previously stated, it is the busiest, most congested freeway in the entire country. But unlike other, lesser freeways, the 405 is busy all the time, not just during rush hour. You may land at LAX at 11:30 at night and jump on the 405 only to be stuck in stop and go traffic. The heavy traffic creates a natural boundary between the Westside and the rest of Los Angeles. It affects the behavior of commuters who have to travel from the east to the west sides and vice versa. Many West LA residents will shop, dine, and work on the west side only even though there are perfectly acceptable options physically closer, but which will take more time to get there. Why is traffic so bad? I mean besides the fact that over a third of a million cars are on the freeway every single day? That would be the construction. 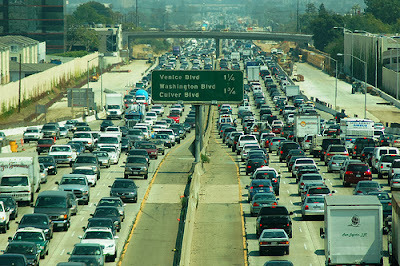 As previously noted in Experiencing Los Angeles the 405 was the site of the infamous and underwhelming Carmaggedon. 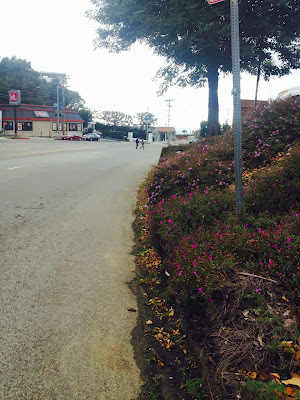 Although in defense of that event, that was the best cycling weekend that the Westside had seen in years. Los Angeles Metro is adding a high occupancy vehicle lane through the Sepulveda Pass that should wrap up "sometime in the next couple of years." In the meantime the 405 is experiencing intermittent ramp closures that make up for Los Angeles's lack of unexpected bad weather. So what do you do when you stuck at home due to a traffic day (its like a midwest snow day but with Priuses instead of snow)? Fortunately the same governmental organization that is responsible for the unpublicized and secret ramp closures also has a secret and unpublicized website of local discounts so that you don't feel the need to go wherever you actually wanted to go, but to stay in the area instead. It even includes hotel discounts. 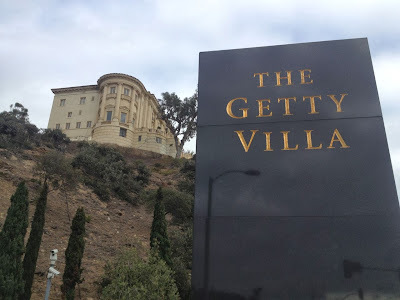 But in the event that you do happen to find a moment when the traffic is flowing smoothly, the 405 happens to run along some great LA sites such as the Getty Museum, Randy's Donuts, Santa Monica Boulevard, and UCLA. 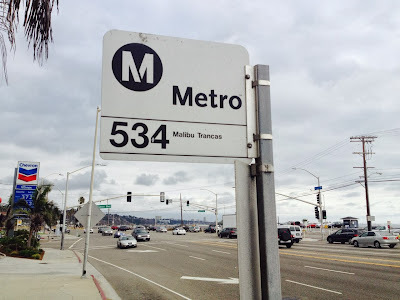 Just in case you think you might be able to get away without driving on the 405, I have some bad news, it also runs directly past both LAX and John Wayne Airport, which means you may want to bookmark this blog and start planning your trip accordingly. While it is true that you will need to factor Los Angeles traffic into your sight seeing agenda, don't worry too much because there is plenty of sight seeing to do on the 405 itself! In addition to being in multiple films and mentioned in several songs it was the site and title of arguably the first viral short film of the internet age. To top it all off, it was the site of the most famous car chase of all time, the O. J. Simpson police chase. One of the major draws of living in Los Angeles is being in a city that impacts the rest of the planet. Like it or not, the entertainment industry, centered in Los Angeles, influences seven billion people around the globe every single day. 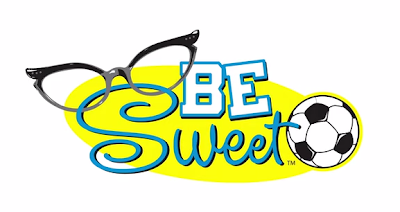 My friend Alex Mebane has been working in Hollywood for years, and is currently assembling funding for Be Sweet - a G rated comedy. How many comedies are there that are funny and appropriate for 9 year olds, and 90 year olds? Be Sweet is trying to fill an huge void that our friends at the Big Six studios all too often ignore. "Be Sweet is the story of a hot tempered soccer coach who gets kicked out of his daughter's U-10 league. So in order to still be a part of her life, he dresses up like his mother to attend her games and ends up being the coach again, but with a slightly different perspective. "I've been playing the "Sister" character since 1985 (based on an older lady I met at her garage sale) and often thought it would be a fun character for a film. Also, for the past 14 years, I've been a youth soccer referee and I've heard parents yell some crazy things. I often write them down. So last summer, I wrote a film that combines the two! I have two daughters that played from kindergarten through high school and my wife and I loved every minute of it. We've all seen the nutty parents at kid's soccer games. Heck, we've all been the nutty parents at soccer games. I want to make a film that captures that misdirected passion and show what happens when you have to, well...be nice...be kind...Be Sweet. 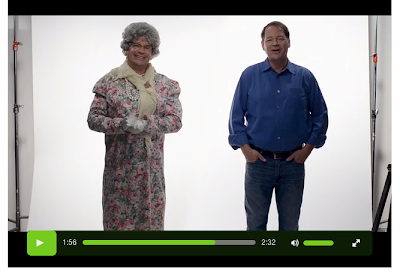 "If you're like me, you probably miss the live action fun, family, G-rated movies of the past. I think we can make a film that's funny and entertaining for all ages, without having to make it vulgar or crass." So how do films get funded? Funny you should ask. Be Sweet is using Kickstarter to raise the funds. So take a risk, click on the link and donate a dollar (or five). How cool would it be to not only see this film, but say "hey, I helped fund this project." It's easy enough to bemone the lack of quality family friendly films. Here's an opportunity to support one. Another way of experiencing L.A. - where ever on the planet you might live.